Meet Bláithín who loves caterpillars, moths and butterflies. Follow her on her adventurous journey with Uncle Rusty to find Pearl, the most extraordinary butterfly with the most exquisitely colourful wings. Learn all about the two little caterpillars and their journey to fly as butterflies and moths. 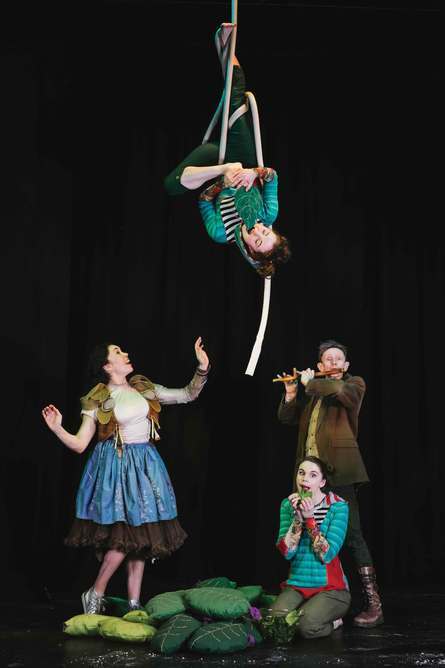 ‘Hatch’ is full of Fidget Feet’s unique blend of music, comedy, theatre, contemporary dance and aerial dance. ‘Hatch’ also weaves Irish language and dancing into this wonderful story, creating a new world for young audiences that is interactive and sensory friendly. It is beautifully crafted and exquisitely delivered, full of unexpected and colourful wonders, which invite children to understand the transformational cycles of life, whilst exploring, interacting and discovering new things about the world of caterpillars, moths and butterflies! There is an arts and craft session as part of the performance where children become part of the story as they are invited on stage to begin their adventure! Suitable for 4-8 year olds.